Once I decided I was going to devote the whole week to Janette, I knew I needed to draw three really different versions of her. The first set on Monday was Janette: Contemporary Edition and now I’ve got Janette: Science Fiction Edition, or as I have nicknamed her- Janette in Space!!! I love sci-fi tv, especially if it isn’t too heavy. I think I’ve mentioned before that I am super enjoying watching Dark Matter on Netflix. I just finished Season One (No spoilers please) and I am going to dive into Season Two soon. I also binged Dirk Gently’s Holistic Detective Agency recently. I’m also watching Midnight, Texas which I can’t decide if I like or if I think is sorta dumb. The Midnight, Texas books are pretty good, if you like Charlene Harris‘s brand of goofy absurdist paranormal fiction, which I always have. She also has a great blog that I read for her book recs. Anyway, to get back to the paper doll, today’s Janette has a ray-gun, or regular gun, it’s really up to you. I like that some of the latest sci-fi shows are just showing normal guns in space, rather than focusing on laser guns. I think it makes the violence feel more authentic, in a good way. Disintegrating people makes it too easy to pretend that wasn’t a person who just got killed on television and softens the danger in a way I often dislike. I have no idea if that last paragraph made a lick of sense to anyone whose not me, so let me know in a comment. 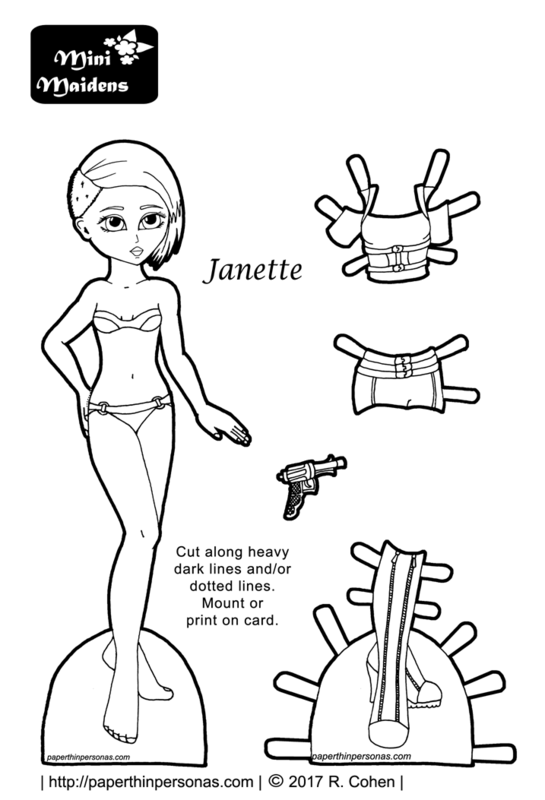 Meanwhile, I hope everyone enjoy’s today’s Janette Mini-Maiden paper doll and there will a third Janette posting Friday. If you like her style, but aren’t sure about her specifically, I have a bunch more sci-fi and cyberpunk paper dolls to choose from. Love her hair!! I think this costume could run from sci-fi to steampunk depending on the color scheme. I’m a big sci-fi fan, too. I’ll have to pick up the Midnight, Texas books — I’m a big fan of The Dresden Files so these sound like they’re in a similar vein.